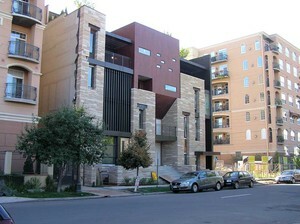 Golden Row Townhomes has 3 townhouses, a total of 6 units. With planar walls and mixed materials of metal, glass and stone, the design details are wonderful. The award winning homes are described as "neo-modernist townhouses". Developed by Cherokee Street, LLC and designed by Sprocket Design-Build this is definitely a property with great character and location. Each townhouse has 5000 square feet, private terraced gardens and roof top decks. Two car detached garages and even in-law suites above the car are available.